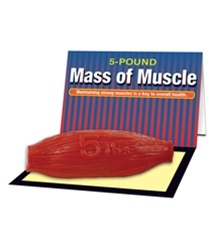 This realistic, weighted, soft model duplicates the look, texture, and density of 5 lb of muscle. Can be used with Rolls of Fat or Globs of Fat to highlight the differences between muscle and fat. The 5-lb model is 9" x 3".